APOCALYPSE, BATMAN The Ride, Colossus, Goliath, GREEN LANTERN: First Flight, Ninja, New Revolution, Scream, Tatsu, The RIDDLER’S Revenge, Viper, X2, and NOW OPEN... Twisted Colossus! Plus over 100 other exciting rides, shows and attractions geared to the entire family. 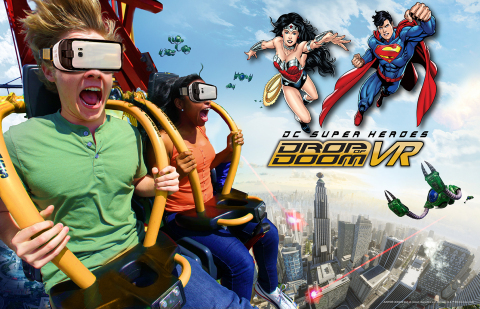 For a limited time, experience the brand new DC SUPER HEROES Drop of Doom VR, an extreme virtual reality experience coming to one of the world’s tallest and fastest drop tower rides. Thrill-seekers will don special VR headsets to view the action as SUPERMAN and WONDER WOMAN battle their nemesis, LEX LUTHOR, while plunging 400 feet at speeds up to 85 mph. Super Heroes Drop of Doom VR delivers an awe-inspiring new thrill for spring 2018! 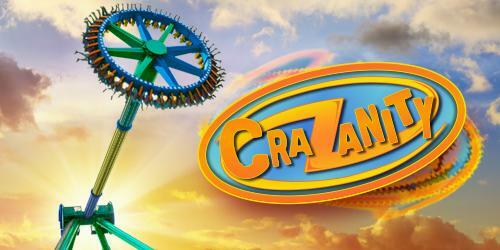 At a record-breaking 17-stories in the air, CraZanity will reach speeds up to 75-miles-per-hour, as it whips back and forth—higher and higher giving riders a staggering view of the world below them. It's a mash up of craziness and fun in the newly themed Boardwalk area with renovated attractions including enhanced bumper cars, dining, games, and shopping. Be one of the first to experience "The World's Tallest Pendulum Ride"! 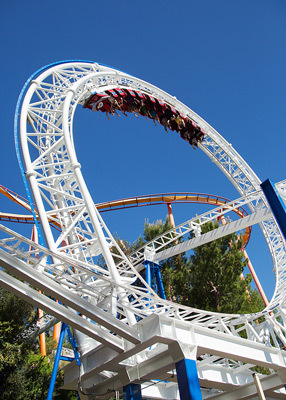 But wait... Six Flags Magic Mountain also has more family friendly rides than any other theme park in Southern California: Buccaneer, Canyon Blaster, Daffy’s Adventure Tours, Road Runner Express, Roaring Rapids, Sky Tower, Swashbuckler, Tidal Wave, WONDER WOMAN Lasso of Truth and more. We haven't forgotten our youngest guests. Within Six Flags Magic Mountain is Bugs Bunny World, a six-acre, interactive wonderland featuring numerous rides and attractions that provide thrills for kids and adults alike. The New Revolution Virtual Reality Coaster! On one of North America's first dedicated Virtual Reality Roller Coasters, you'll experience thrills like never before. In partnership with Samsung Gear VR and Oculus, The New Revolution will be equipped with wireless headsets that, while wearing, allow you to enter a virtual world with high-resolution imagery and 360-degree views that synchronize to the action of the coaster! Valid for one General Admission (3 years and over), Valid any ONE operating day thru Sept. 15, 2019. Valencia, CA.